Bandanas are cool, stylish and fun. Why choose a generic design when you can personalise your own bandana? Design online and upload a photo, art or collage and create your custom bandana here. Custom print bandana makes a great choice for a unique gift or as a stylish treat. Upload a favourite photo or a design to print your own bandana, creating a true style statement. Our custom bandanas are printed edge to edge and hemmed beautifully by us and are made with gorgeous Pima Pawn cotton fabric. 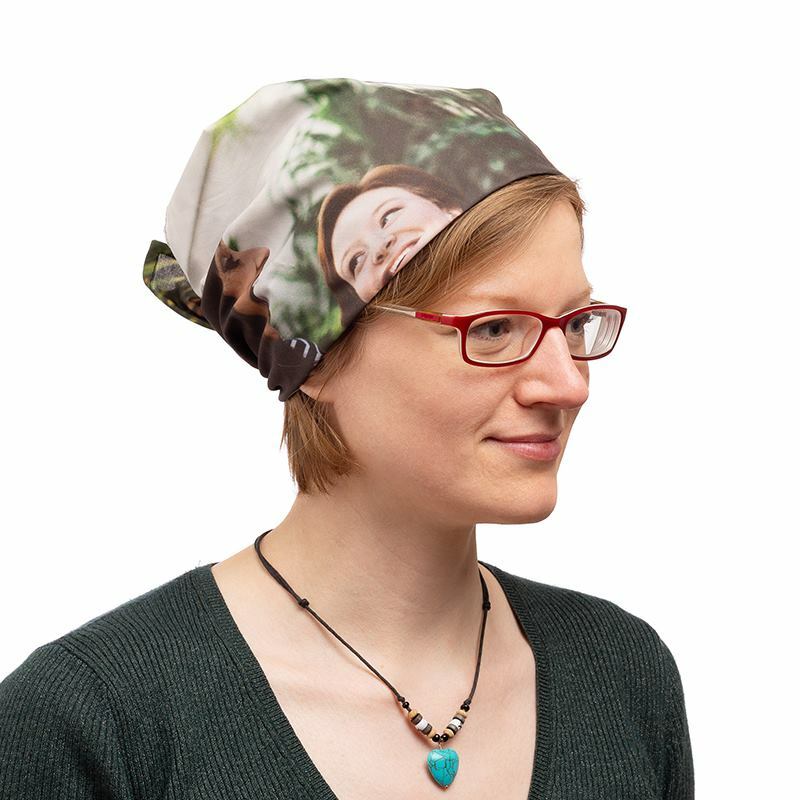 Whether you want to use a single photo, a photo montage or a fashion design you are just in love with, you can be sure that they will look great on your customised bandana. We love to design ours with our names printed on bandanas, so they don't get "borrowed" by other people. Well, they are pretty fabulous. The Pima Lawn cotton is a great and cool fabric for the summer. All bandanas are printed and made by us and finished with a chic pin hem (approx 4mm). Care: Pima Lawn cotton can be washed at 30°c. Your design is printed onto the fabric by our technicians, using a digital printing method that penetrates deep into the fibres of the material. This uses eco-friendly inks to create a long lasting, highly detailed, rich colour print. Our craftsmen will then cut your custom printed bandana to size before our seamstresses hem the edges. Everything is checked for quality throughout the process, as well as being given a once over upon completion before being sent out to you. Collage bandanas are always interesting. Use our collage app to make a great bandana with a collage. A bandana is a key fashion piece and can be used in several ways. Use it as a headscarf, a neckerchief, a sweatband, a dustmask...and whatever else you can think of. They are used as style and fashion accessories and can be even more special if you design your own custom printed bandana. Our easy to use design interface makes it simple to create a cool bandana printed and sewn to suit your style.